This week is really a lazy bento week. I don’t feel like to cook and don't have much inspiration for bento. I even don't feel like to take picture for it. So today's bento came out a bit off ... My bad! Inside the dark pink box : rice balls. Inside the light pink box : fried chickens, sauteed asparagus, and fruits cocktail. Don't forget to join WHAT'S FOR LUNCH every Wednesday! Put your blog link now and share with others. That's your lazy day? I would do it that way every day; it sounds lovely to drop it off right before lunch then hang out in Starbucks! 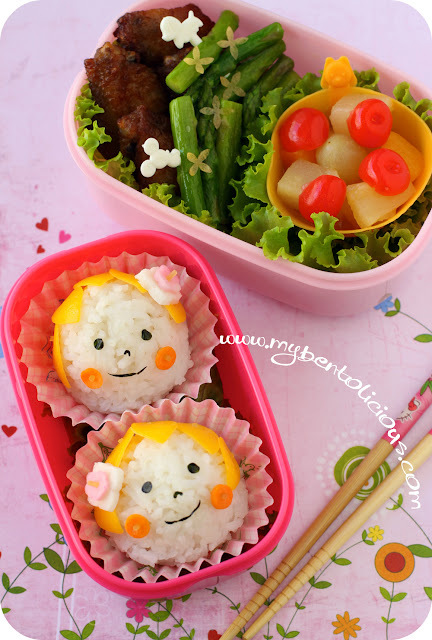 Then you can sleep later :) Pretty rice faces brighten up the colorful bento. You got new picks? I'm looking here for ideas Lia, thank you! Lia...kangen banget liat bento2nya..udah lama gak browsing..
stil..yr work...is amazing too me..eventho it's a lazy day..
@Deby Suwito : Thanks a lot Deby! How are you? Where have you been? Miss you and your bento ... Are you taking a break for bento? This is a lazy day? Have you seen my lazy day bentos?...lol I think they are adorable! Even when you are lazy you make bentos look beautiful and effortless. I love the sauteed asparagus, one of my favorite vegetables. My husband was just saying that I should get together and meet my bento friends in person. I think that would take a lot of frequent flier miles! Ha ha! Happy Wednesday Lia! Hahha... I understand perfectly how you feel but I get all insipred again when I flip those bento books! Hope your mood will be back soon! @Kuusou : Thanks a lot! OMG, if this is your lazy bento then my best bento STILL pales in comparison. haha! Still so cute and amazing!